Set in the distant future, the world has ran out of crude oil. Solar power has become a mainstay form of energy for sustaining human civilisation. This piece of artwork illustrates a Sun Facer energy generator in action. Sun facers are the ubiquitous Solar energy storage machinery of the future. This particular one towers over a lake. Its solar panels are designed to always face the Sun or any source of bright light. They are humbly harnessing energy from the Sun. This conceptual design and artwork relied on Rhinoceros 3D’s Grasshopper algorithmic creation power for generative design and form construction. Below are screenshots of Grasshopper (Rhinoceros) in action. The grasshopper definitions are crafted such that all the solar panels will always face the Sun direction. 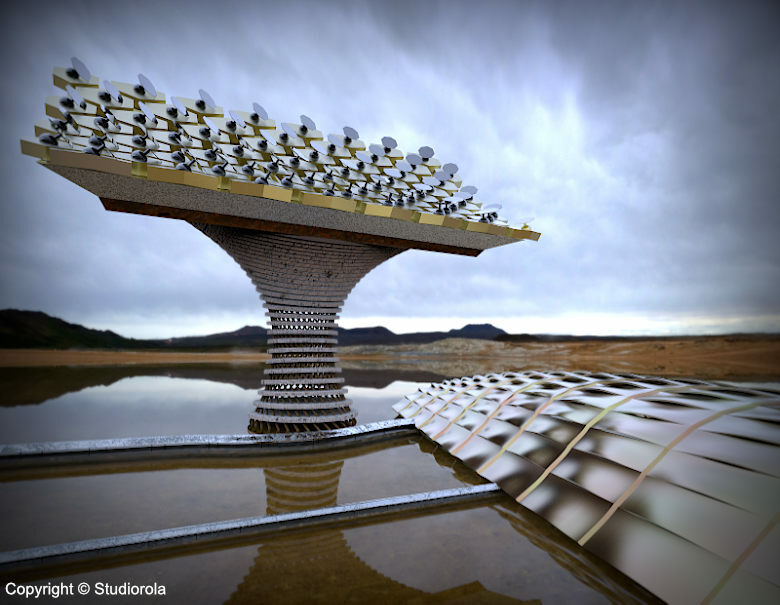 The solar energy are channeled down spiralling tubes to a storage zone situated below the surface of the lake. 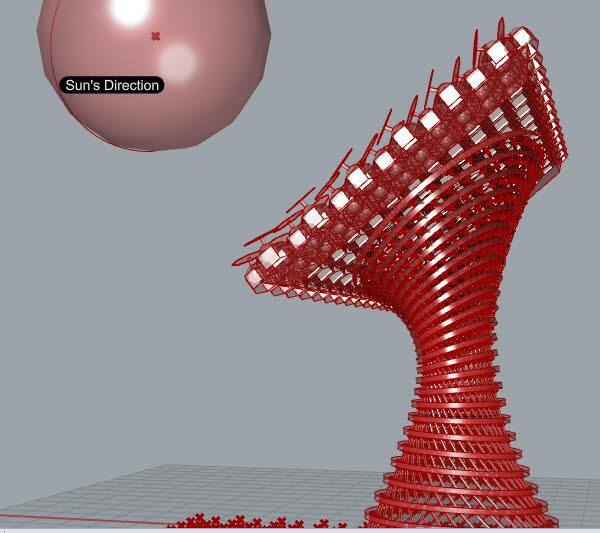 The supporting structure beside the Sun Facer was also modelled using generative algorithm. The parametric nature of the surface construction allows for iterative refinement via numerical value changes to various aspects of the design. For example, the number of solar panels can be changed on the fly without the need for tedious re-modelling. This capability has proven to be a valuable time-saver. When the Grasshopper-generated forms and structures are finalised, they are baked as Rhino surfaces. The conceptual forms were then visually realised using Keyshot 3D rendering software. Lastly, the Keyshot rendering was saved as a high dynamic range image and brought into Serif Affinity Photo for post processing. Note: Serif Affinity Photo is a 2D image editing program.